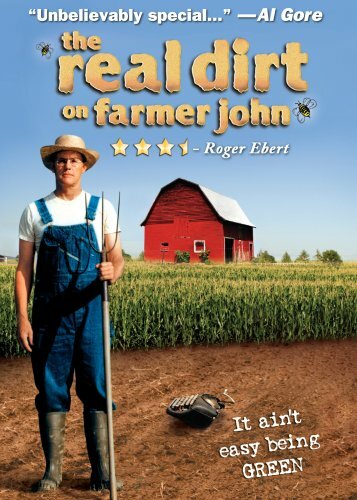 One of many amazing things about this program is that it was filmed over 25 years of friendship between John Peterson, the farmer, and Taggert Siegel and Terri Lang, the filmmakers. John Peterson grew up on the family farm, taking it over as a teenager when his father died. He went to nearby Beloit College and discovered a more bohemian lifestyle. Many of his friends hung out at the farm, and that didn’t sit too well with the traditional folks in his area. Financial problems forced him to sell most of the family land, and he went off to Mexico to regroup. When he returned, his feisty and inspiring mother lent him the money to start farming again on his remaining 22 acres. He worked 80 and 90 hour weeks, this time growing organic vegetables. His mother — now in her 80s — sold them at a stand and loved doing it. Eventually he confessed to her that the backbreaking work was getting to him, but she said the stand was her life. He kept on, and we are so glad that he did. He goes biodynamic in his growing methods, and the last bit was so satisfying that I won’t tell you how things go for him and the farm!